Portable, easy handling lifts are perfect for multi-location use. Designed for a hard industrial work load. Saves valuable man-hours in the plant or warehouse. 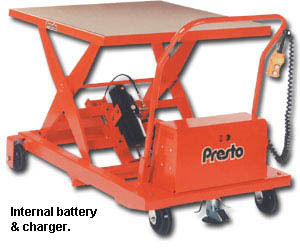 Features a leak-proof 12V battery, which powers a DC motor and hydraulic pump to lift and lower loads up to 36â at the touch of a button. Built-in 5 amp battery charger is standard. FOB Shipping Point. Product No. Lift Cap. (lbs.) Lowered Ht. Raised Ht. Stand. Plat. Size Max. Plat. Size Lifting Speed (Sec.) Ship. Wt. (lbs.) Price Ea.